This is both a use-case, and a question about conditional alerting. I've recently taken to using Tableau for some conditional alerting for our clients. I've created a basic .twbx mockup which should be a great starting point to getting there. Basically, we have a number of factories across different clients, and our service depends on making sure those clients attach one of our serial codes on their factories before shipping out to retailers. We need to set up a notification system the notifies each individual client if there is a significant drop in the number of codes attached in a given week. One challenge is that I don't want to do a total threshold, or even a percent difference threshold because different factories have different dynamics. My solution is to setup a notification to the client if the week-to-week difference in number of codes created is less than one standard deviation below the mean for the factory (again, based on week granularity). 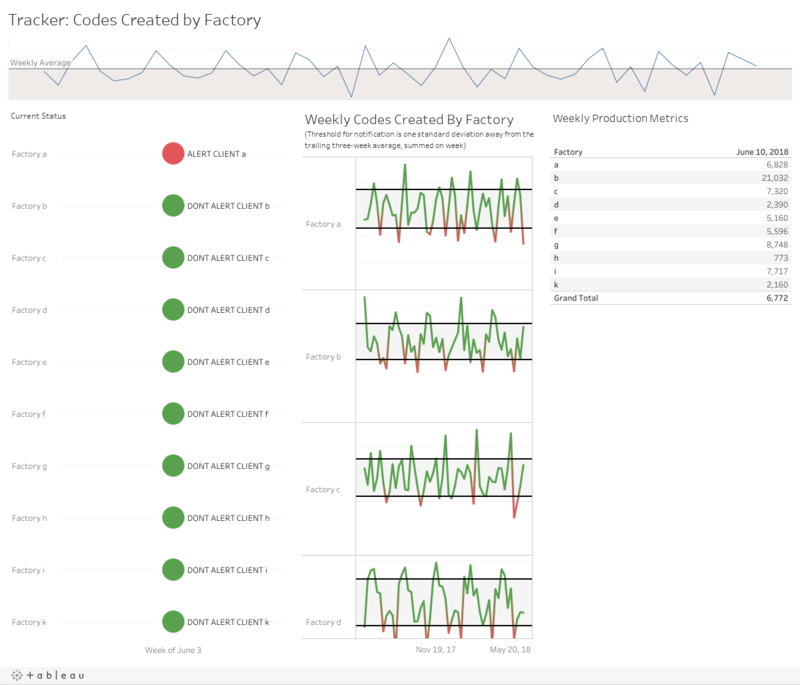 And to also create a time-series view so that the client can log on to see the number of codes created in the factory. The client is pretty happy with this, and internally, they pretty satisfied as well... but the next step is what I'm wondering about. I want to set up an alert on Monday if the previous weeks' data saw a significant drop in codes created. I've used Tableau's built-in notification functionality before, but I've noticed that this notification strategy will send out a notification if any of the conditions are true. My idea for a work around is to create another worksheet to set up the alert, but I would like to send the client a notification with a .jpg of just their factory with the trailing eight weeks or so. I know this combines aggregations, and is not the right way to do this, hence my posting here. I'm not very familiar with notifications but I've got a question about your approach; why don't you just create a separate viz for each factory and then set your notification trigger off these vizzes ? You can still have the combined dash that shows all of the factories, but the work effort involved seems a lot less exhausting than what you are trying to do now. That was the idea. To create a new worksheet for each client, that is hidden from uploading to our Tableau Server. My question was more about how to use a Standard deviation, aggregated by week, rather than a percentage change or a change in sum from week-to-week... because some client's factories only make dozens of product requiring serial codes per day, and some make thousands. Then I duplicate for each factories (this might be a challenge as we scale up because we're set to have some 200 factories by the end of the year. Building separate vizzes for each client, or better yet, customized views for each client, then creating separate alerts on each could work, but it doesn't scale if you've got a lot of clients. For conditional alerting and reporting (aka email bursting) that must be customized for each recipient, consider VizAlerts if you're using Tableau Server. It was built for this sort of work. I've considered that.... unfortunately I think the installation process is a little heavy on the networking aspect which I'm not so caught up on. We're a lean team - our data services team right now has three people, and I'm pretty much to only Tableau guy. Tableau doesn't offer product support for VizAlerts... would be a nice addition to the native features though. Wanted to update this with a new packaged workbook. This workbook is identical to the one I'm using for my company, only with fake data. In the bottom left, you will see what I've a worksheet called "Current Status". Essentially this worksheet is only showing data from last week. Once this is up on our Tableau Server, what I'd like to do is notify myself and my boss whenever one of these filled circles is red, notifying him which factories are offline - the ones that say "alert"
Have you managed to find a way to trigger an alert when alert="Alert" ? I don't know much about data-driven alerts, but would you have better luck if-- instead of using string values-- you use a continuous value axis (where 1 = Alert and 0 = Don't Alert) ? Besides forcing a 1/0 return value, the other trick is to use filters or logic in your calc to filter out any data you don't want to be alerted about (past values, for example). If your dash only ever shows currently alertable values, though, then you don't have to worry about that. "If your dash only ever shows currently alertable values, though, then you don't have to worry about that."